Can you recommend books on both theory and practical aspects of X-ray machines? If you have schematics of any such machines, that's also relevant. I cant post schematics because they were given under NDA. I'm quite familiar with older type x-ray machines. They're quite simple. Most of them are basically a large 20 kV oil transformer with a variac at input. Some of them even don't have any rectifier, they just output AC (10 to 50 kV, 20-30 mA is quite usual for XRD (X-Ray Diffractometry) equipment, up to 100 kV for medical equipment). The X-Ray tube acts as a rectifier, it IS basically a just large vacuum rectifier of special shape. The tube itself is the most interesting part. Anode is always water-cooled and thus grounded, high voltage is applied to the cathode (and to the filament too). There are also pulsed machines, used mostly for defectoscopy. They are air-cooled and may be battery powered. They emit very hard, short-wave x-ray that is able to penetrate metals. Are you interested in any patricular type of machine or its applications? The difficult we do today; the impossible takes a little longer. I sometimes (now very often) rework BGAs (50x50 max so far), and at the moment have to take them to a friendly university lab to inspect with their x-ray machine. I looked into buying my own machine, but they are quite expensive and I am unfamiliar with owning/maintaining such a device. 2. Can I build my own machine or adapt something that already exists? What size would this machine be approximately? 3. 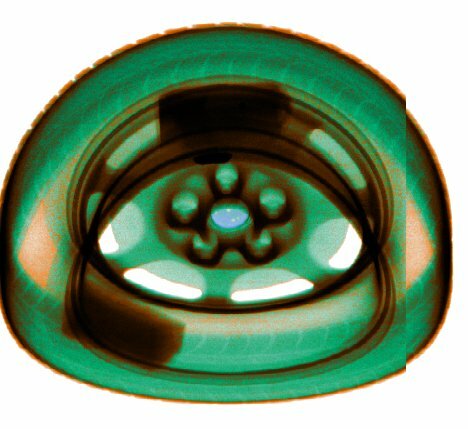 What constraints are there in an x-ray machine that inspects chips? For example, is it possible to damage the chip if the machine is too strong? What I need is a basic intro like 'X-ray machines 101' to understand what I can put together myself and what I'll need to pinch from an existing piece of equipment. Schematics of older machines would be very useful (obviously if there is no NDA involved). It is possible to build one youself. Certain types of valves can be utilised as X-ray tubes. See http://www.fingers-welt.de/gallerie/eigen/elektro/roentgen/roentgen.htm (in German, you may need google translate). Though you would probably want something a bit more robust for a practical application, as opposed to just building one for experimentation. Don't forget your lead underpants if you try it though! Pretty simple. A X-Ray tube is just like a very first vacuum diode: a vacuum tube with a filament that acts as a hot cathode and a large anode. The anode is usually quite large and water-cooled. High voltage (20-100 kV typ.) is applied across this tube. At the place the cathode electron beam hits the anode, X-Ray appears. Basically any HV vacuum rectifier produces X-Ray. The only difference is the shape of the anode that helps to direct the beam in a certain direction. Another difference is power - an x-ray tube is about 1 kW (that's why it's water cooled). To make a sharp image, a "point" x-ray source is needed. Many medical tubes have such an anode. The registration is quite simple too. Just a cardboard with some fluorescent paint. The fluorescence is viewed using a camera or photographed. Yes, for sure. The hardest part is x-ray protection. Thick metal (lead or similar) screens, leaded glass or rubber and so on. It is wise to place the machine in a separate room and control it remotely. The size of the machine depends on this protection and on the power supply. You'll need about 1 kW at 40 kV. Older machines had a HUGE oil tank with a transformer inside, 400 pounds or so. Imagine a big pole transformer. Modern machines use switching power supply that fits in 19'' rack, maybe 2U or 3U size. The X-ray tube itself is a cylinder of about 2 inches in diameter and 8 to 10 inches long, with high voltage connector at one end and water fittings at another. It is to be completely enclosed in a protective screen. It is hard to damage the chip. It is more likely that you just won't see anything. If the machine is too strong, the chip will appear completely transparent. It is more likely that you'll get a blurred image. Since there is no such thing as X-ray optics, you have to rely on a small point x-ray source to get a sharp shadow on the fluorescent screen. Not all tubes are sharp enough. There are tubes that produce a wide beam, typically used for XRD or cancer treatment. It is hardly possible to see individual BGA pins using such a tube. The rules differ from country to country. Basically an X-ray machine should have some kind of safety certificate. In some cases the whole room has to be certified, not the machine alone. X-ray propagates like a visible light, so it is possible to have a narrow beam going through a gap in the protective screen. This is hard to find but this is very dangerous. It is even possible to be burnt with an x-ray beam, this looks like a solar burn on a spot of the skin. Lower dozes of radiation are cancerogenic. BUt it is very simple. Imagine a high voltage power source (maybe just a transformer, no matter if it is AC or DC) connected to a big diode valve (x-ray tube). That's all. Everything else is just a video camera, safety interlocks, water pump for cooling (if any), stepper motors for sample movement and so on. How else can I quality-check my BGAs? Is X-ray my only option? I've heard a high dose of X-rays can erase some OTP devices, I don't know about flash. If it were me, and thankfully for me you're not ( ), I'd probably find some other way to test installed BGAs. What are you inspecting, precisely? Microcontrollers? A good power up self-test ought to detect properties out of spec that could indicate a failure in that respect. Though process of elimination, you would inspect the board (visible components, from most likely to be the problem through least likely). After that if you still suspect the BGA device, I would at least try a reflow with hot air, since, even if you find an issue via X-ray, that's what you'll be doing to fix it anyway, right? Here's one of the scenarios that happens. Say a computer repair shop takes on a laptop with the Nvidia chip problem and does the trick of squirting flux under it and reflowing it. If this works, they then give the laptop back and the customer leaves happy. Sometimes, however, the customers come back with the same problem, and then the shop sends the laptop to me for BGA reball or chip replacement. If the chip is still alive, I reball it, put it back onto the board, add some heat management measures where possible and send the laptop back to the shop. It's these reballs that I'd like to be able to inspect. In the past few years I've had very few returns, but I do want to have a way of seeing what the solder balls are doing under the chip. I'll now start looking for other ways to inspect BGAs and see what's available. In the meantime, if you guys hear something, please post. Some countries may have regulations on operating X-Ray machines, especially as part of a business. Check with your local friendly Health and Safety authority. In terms of safety, the fact that X-Rays don't really reflect off anything means that operating them vertically can reduce shielding requirements significantly (as long as there are no neighbours upstairs or downstairs respectively), but you probably still should have some monitoring program. People have done homebrew X-rays using vacuum tubes, but the problem will be getting a source small enough to resolve BGA balls. Dental X-ray kit is pretty cheap, either used on ebay or new from China, but I don't know how suited the characteristics are - maybe talk to a friendly dentist to try it out. There are a few people at The 4HV forum that have done homebrew X-Ray who may be able to advise further. This has been discussed many times over the years, and the consensus seems to be that a dose sufficient to erase would also cause significant damage. I doubt a laptop manufaturer would bother reballing an IC, they're more likely to replace the entire board or even the laptop and swapping the hard drive afterwards. The manufacturer has to conduct some quality inspection when they let the products out the door, and I have seen this process with my own eyes. In any case, my concern is PCB repair, and Mike's link is next on my to-do list. While I am trying to find a suitable x-ray-type solution to my problem, I am still very keen on learning about alternative methods of BGA inspection. In fact, it's not only about the dose. It's also about the wavelength. There are basically two kinds of x-rays - Bremsstrahlung and fluorescence. At lower voltages there is nothing but weak wideband Bremsstrahlung. At certain voltage a strong narrow fluorescent line appears. Medical machines tend to filter Bremsstrahlung completely, acting only at hard fluorescence lines (this is more safe for human). Since BGAs are quite absorbing, strong hard fluorescence pulses should generally act better than continuous lighting. This would require a narrow-spot pulsed X-ray tube (maybe even of cold-cathode type). In principle, a separate room is not strictly necessary. Newer machines have pretty good protection and do not require separate rooms (remember these airport x-rays?). Avan a machine with virtually no protection can be placed anywhere as long as you have two rooms. JUst place the machine itself in one room and the control panel in another. That's pretty safe as long as nobody is in the same room with the machine while x-ray on. That room may be used for any other purposes while x-ray off. Not sure aboul legal regulations about such usage. (In Russia it is forbidden, but it is not about x-ray. It's about high voltage. Since x-ray machine is considered HV equipment (Russian class 4 of operation), it has to be placed far enough from everything else with the HV cable hanging from the ceiling, if any). Yes you can damage electronics, flash memory is susceptible to high levels of x-rays. But it really has to be a lot higher than the level used for imaging before the chance of corruption gets to a significant level. I was contracted to look into this and write documentation that airport staff could issue to the countless people who try to blame the airport x-ray machine when they discover problems with some of their property that went through the machine. It's mostly people who's camera flash memory cards become corrupted at some point during their holiday. Normally it's FAT table damage from pulling cards out etc.. and of course that doesn't always show up when it happens. The camera just starts overwriting clusters in use by other pictures. So when they finally get home from their holiday and go to copy off all their pics they discover the corruptions and assume it only just happened. The level of x-rays used at the airports is low. Mostly due to the fact that the image is detected digitally and not on a photographic plate. But even this is still quite low, electronics are much less susceptible than people. You can't really say X level is 100% safe for people or electronics as it's all statistics but we did some tests sitting various devices on the x-ray beam with the conveyer belt stationary for 5 minutes straight (floppy disk, hard disk, and a couple of flash memory cards). They all worked 100% fine afterwards and the math showed the x-ray radiation level for 5 minutes continuous was equal to that of the object being put through the machine over 9000 times. In the US they use x-rays to sterilize postal mail to government departments. They use a level around two million times that of a medical chest x-ray and there have been reports of damage to electronics put through that system. So you can damage electronics but it requires a lot more energy than imaging x-ray machines produce. To Gall and Psi: can you please recommend a crash course on x-ray technology? Something with pictures, diagrams, sizes. I need to form a mental image of what's involved in the project to see if this is doable by me and if so then in what time frame. I can't think of any courses off the top of my head. I never did one, all i do is fix the machines when they break down if the official repair guy (my dad) is unavailable. What other people have said about voltages and the x-ray generator is spot on. The only extra bits involved are the sensors, conveyer and software to read/interpret the data. The sensors in the machines i work on are arrays of photodiodes in dip package covered up with a material that lights up when exposed to x-rays. Lots of these are used in a row to get the resolution needed (some behind others and offset) The machines use two different versions of the sensors that are covered with a different thickness of this material (thick/thin). The reason for this is that comparing the two you can detect extra properties of the material being xrayed. (Since only high energy xrays can get to the diode array with the thicker coating) So you can detect that the material has X density and has Y ratio of high to low energy xrays that got absorbed. The xray generator produces xrays and is shielded except for a slit. Any x-rays that pass through the slit spread out along the direction of the slit and hit the sensors which are mounted along the top and down one side of the machine in line with the slit at the bottom. The info from the arrays is joined together which gives an image that moves from a top view to a side view, it looks quite strange. Here is a car tyre which shows this quite well. Hm. All my books are in Russian. I tried to draw everything on a single sheet of paper and scanned it. If you're interested in some more specific topic, please ask. Russian? ? Vy pishite kakie knizhki poleznye, gde po suti izlagaetsya praktika (Landau-Lifshitz ya uzhe chitala ) ya poischu na Library Genesis ili s torrentov skachayu. This is a happy coincidence indeed! "The Bible": M. A. Blokhin, "Rentgenovskie luchi". Also: F. Haraja, "Obshij kurs rentgenotexniki". Obe starye, no eto nevazhno. Sovremennaya texnika otlichaetsya tol'ko razmerami bloka pitaniya. Osnovnaya informaciya po "zhelezu" - serija sbornikov statej "Apparatura i metody rentgenovskogo analiza". Tam mnogo vsego i trudno chto-to najti. About the sensor. Older machines used just large sheets of x-ray sensitive film. A fluorescent cardboard was added to improve sensitivity. It had to be developed in a darkroom. Medical machines for fluorography of the most common Russian type use just a large sheet of fluorescent cardboard that is photographed using an ordinary large format film photo camera. Newer machines use either a digital camera or a photodiode array attached directly to that cardboard, depending on the size. If you're brave enough for a DIY machine, consider a sheet of fluorescent cardboard and a cheap digital camera. An X-ray tube is very easy to get, too. The only thing one has to worry about is sufficient protection. And, of course, legal issues. Vintage machines had lust a fluorescent screen that was directly viewed by the eye. Due to insufficient X-ray protection this type is not used anymore. While it is still possible to use some periscope-like optics to watch the screen, it is easier to use a camera instead.